This is a story about a house; it is also a story about a dream. The house at 2543 North Holton was built in 1880. It was built of brick with a front porch that stands proudly at the top of seventeen stairs and a basement/commercial space that opens out nearer to street level with only four steps. Over the years the space inside the sturdy walls was divided and subdivided. By 1990, there were three families crowded into a house designed for one family. That meant a lot of wear and tear on the building. 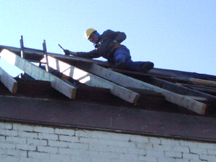 Repairs went undone; when they were done, they were shoddy. The once-dignified house deteriorated. In 2001, an arsonist set fire to the house and it became uninhabitable. It stood abandoned for two years. The City of Milwaukee issued condemnation orders and the house was slated for demolition in the fall of 2003. It came within one week of being reduced to a heap of rubble. At this point the dreamers like Tom Stocco entered the story. Ever since his student days at Marquette, Tom imagined the possibility of investors banding together and helping each other. The inspiration for his dream was not some abstract political or economic theory but the film It’s a Wonderful Life. This classic American drama revolves around the character played by James Stewart. His character has great faith in the capacity of a community of people to control their economic future. He believes that his neighbors can help one another by pooling their money. He does not believe that they need stand helpless against the power-hungry bully who tries to control the town and gouges his tenants by charging exorbitant rents. Tom Stocco has a different style from James Stewart, of course, but he agrees with the hero of the movie. He speaks of the need for “an economic engine in Riverwest.” He points to the fact that there is no bank in our neighborhood that will loan money for start-up businesses. Once upon a time the Holton Street Bank stood at the corner of Center and Holton. According to neighborhood historian Tom Tolan’s Riverwest: A Community History, “Within six years of the bank’s founding, business was going so well that a larger building was erected on the same site. Completed in 1927, the imposing brick structure …became the anchor of Riverwest’s most important business district.” But once that neighborhood bank closed, nothing came to take its place. We have no locally-owned anchor for a business district any more. The assets of our neighborhood tend to be invested outside the neighborhood. “How do we keep the assets of our community right here in the community?” That is the fundamental question that Tom Stocco poses. The idea of housing investment seemed natural enough, given how real estate in Riverwest is going for higher and higher prices every year. All too often though, in Tom Stocco’s view, the increased value is transferred out of Riverwest and never seen again. For example, when a duplex is bought by a private investor for $100,000 and then sold for $200,000, there is $100,000 in equity that is siphoned off. Tom dreams of redirecting such equity back into the neighborhood. It’s an idea whose time has come. Last April, after the Currents ran an article about a meeting for people interested in launching a housing investment cooperative, a crowd of more than 35 people turned out. A mission statement and organizational structure were developed, and in May 2003, the Riverwest Investment Cooperative held its first annual member meeting. By the end of June, it was legally incorporated. 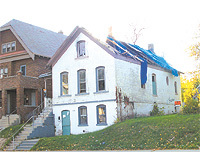 In October the decision was made to purchase the distressed but solid brick house on Holton. Just as the bulldozers were poised to move in, the City of Milwaukee cancelled the demolition orders and RIC bought the house. The house on Holton is RIC’s first undertaking. The goal is to completely renovate the property and sell it to owner occupants committed to living in the neighborhood. Money earned by that sale will be used to buy another house, which will likewise be restored and sold to people who want to settle in Riverwest. Through this activity, RIC hopes to provide affordable family housing and gradually improve the stability of our neighborhood. Nobody had any idea how much work would be necessary on the Holton Street house. Since RIC obtained the property, members have gutted it, hauled away more than five dumpsters’ worth of debris, roofed it, and drawn up a game plan to complete the rehab. In order to pay for future improvements, the RIC board of directors applied for a loan, another undertaking which required far more work than anyone predicted. That work paid off, with a $105,000 buiding construction loan approved by Lincoln Neighborhood Redevelopment Corporation in late August. On Monday, August 23, members came together to see the progress on the property, enjoy refreshments and to elect a new board of directors. The occasion was RIC’s second annual member meeting. The house was spruced up for the event: its raw wood floors were swept, pigeons were shooed from the attic, and the first floor was transformed with overhead lights, folding chairs and vases of fresh flowers. The once-abandoned brick house overflowed with enthusiasm and pride. To be continued in October…with information about finishing work on the house and the cast of characters who have played a role in the ongoing story of the Holton Street house. Anyone interested in purchasing the house or becoming a member of RIC should contact Quinn Wilder at 414/372-5052. RIV is online at www.riverwestinvest.com.